… from Young Women is into the arms of the Relief Society, where you will learn to become a woman of God through serving Him. There is a wonderful place waiting for you after Young Women. It’s a place where you can grow closer to your Father in Heaven. A place where you will learn to become more like the Savior through service. A place where you will make some of the best friends you could ever imagine, where you’ll find sisters you never knew you had. Relief Society is that place. “Relief Society is more than a class,” says Sister Bonnie D. Parkin, Relief Society general president. It’s where you will go to continue to learn how to become a woman of God. “We have a prophet of God who loves the young women of the Church, and because he loves the young women so much, he wants to make sure that the Church is going to be part of their lives. The prophet knows what Relief Society can do for your life if you will just step forward,” says Sister Parkin. It’s true that making the shift from Young Women to Relief Society can seem a little scary, but “that’s just part of growing up,” says Sister Susan W. Tanner, Young Women general president. When you become a Relief Society sister, the knowledge you gained in Young Women will be added to, and you will learn more about being a covenant woman of God. “Womanhood in The Church of Jesus Christ of Latter-day Saints means active participation in Relief Society,” says Sister Parkin. 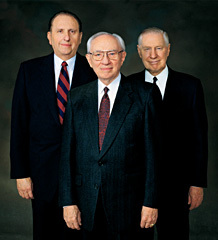 —President Gordon B. Hinckley, President Thomas S. Monson, and President James E. Faust, First Presidency letter, 19 Mar. 2003.